Chinese diplomats have told top Cambodian officials the recent crackdown against Chi­nese illegal immigrants is discriminatory, according to First Deputy Governor of Phnom Penh Chea Sophara. Chinese Ambassador Yan Ting Ai told the deputy governor last week that authorities appear to be selectively targeting Chinese nationals, while illegal immigrants from other countries such as Vietnam remain free, Chea Sophara said. Chea Sophara disputed the assertions, which he said were conveyed by the ambassador in a two-hour meeting at the em­bassy. “We do not consider nationality when we make the arrests. If anyone is found without proper documents, they are arrested and sent back to their country, regardless of what country they come from,” said Chea Sophara, who has spearheaded a campaign that has netted more than 610 Chinese nationals without proper travel documents since Aug 19. Chinese diplomats did not re­turn phone calls to the embassy Thursday. A Foreign Affairs Ministry official confirmed Chea Sophara met with the Chinese ambassador last week and that the ambassador asked if authorities were targeting only Chinese nationals, or illegal immigrants from Viet­nam and other countries also. Chu Dong Loc, a Vietnamese Embassy spokesman, said he would not comment on the issue. Opposition leader Sam Rainsy and student groups regularly allege that Vietnamese are illegally settling in Cambodia. 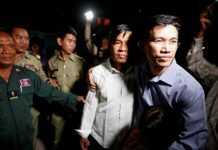 But few arrests of Vietnamese nationals without legal documents have been announced by the government in recent years. 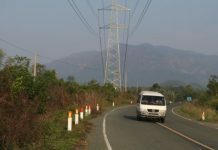 Since the newest campaign against foreign intruders began two months ago, only three Vietnamese nationals have been apprehended. 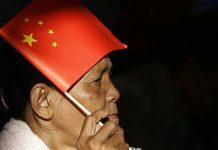 Government spokesman Khieu Kanharith said the Chi­nese Embassy is irked because of the publicity surrounding the campaign. “They’re displeased about the publicity,” Khieu Kanharith said. Chea Sophara maintained, however, that relations with China are normal. “The Chinese officials are still cooperating with us and we can send back the illegal immigrants we find,” he said. He said hose Chinese nationals in detention and any arrested in the future would not be tried, even though they have apparently violated immigration laws by entering Cambodia improperly. “A trial is not the best way,” Chea Sophara said, later denying that Chinese officials had pressured the government not to file legal charges against those arrested.